I just started cooking supper now. 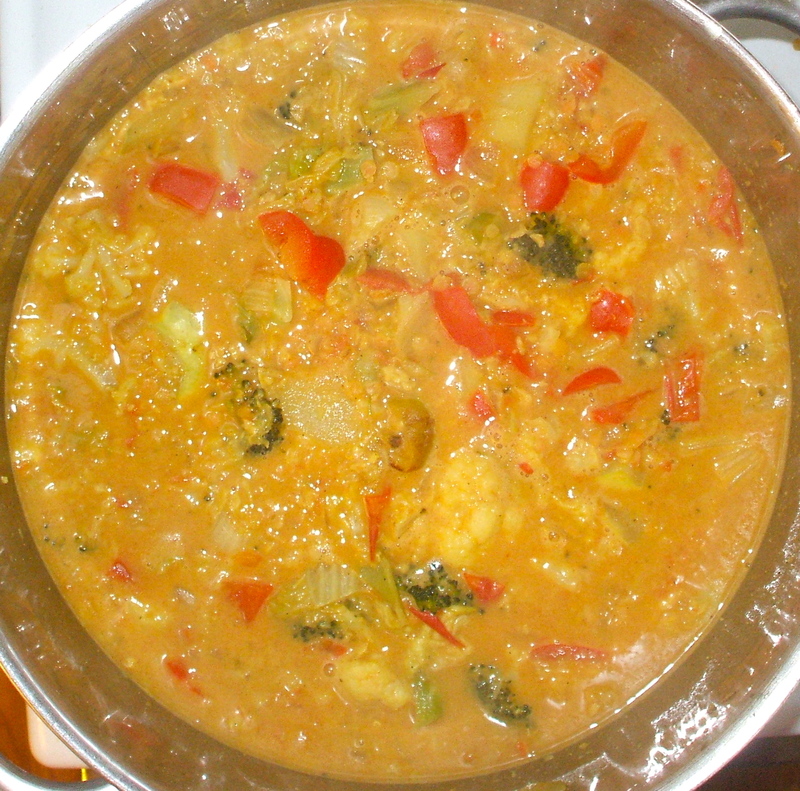 A fall vegetable and red lentil stew of my own creation. The house smells really great as this simmers in the large pot on the stove. It would be so much more satisfying to be in the forest to eat this meal. It is 11 degrees in the Kingston area now. A little bit cloudy and damp. Imagine a long, well paced walk in a forest, while it is preparing for its long winter nap. You can smell and see the changes that nature brought us in the past days. A few chipmunks gather the last of their stash, the hornet nest preparing to sleep, birds call as they are flying over you going south. You are just a little out of breath coming back after the hour, but you can smell the light spicy aroma as you approach the cozy Tiny House. Keen to see how it looks, you all fresh and rosy cheeked peek into the pot and see this just as the open pot reveals a deeper scent of onions peanuts and peppers. Mmmmmmm! Food tastes so much better after a bit of time with the natural world. Anyone else want to be doing just this? 2 tablespoons mixed herbs parsley, thyme and sage is what I had. Once this is all soft and ready I took it off the heat and added a small can of coconut milk for the under flavour. It sounds like you are cooking up a great meal there with your granddaughter! I am not a grandma but I do have a very young niece named Violet, who I cannot wait to share days just like you are having. Enjoy your weekend too and please thank your granddaughter for her interest. My husband is 12 years my senior. I’m 29 and my grand daughter is 2. People dont understand our family, most people think she’s my daughter Lol. Maybe some day if its in the cards I’ll have a child of my own, if not I spoil Elizabeth like my own anyway. Tomorrow I think we will take a trip to the library for books. She loves books and nature. I grew up in a meat and taters home… still like taters a lot. Hi Laura, That looks Delish. Right now its raining here in Kitchener and its only 3 degrees. So today was a stay inside day for my grand daughter and I. We spent the morning watching Dora and so far this afternoon we have made homemade apple sauce, slow cooker lasagna and are baking Halloween cookies. I would love to be walking in the woods with her. She loves looking at the pictures you post. I hope you have a great weekend.